Meet Andi Mack. Today, Disney released the premiere of their new series online a month ahead of its TV debut. 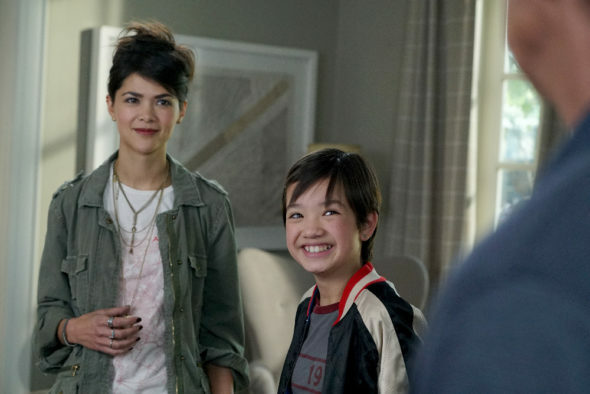 From Terri Minsky, the comedy follows Andi (Peyton Elizabeth Lee), “a 13-year-old girl who finds herself questioning everything she’s ever known after her older sister returns home unexpectedly.” The cast also includes Sofia Wylie, Lilan Bowden, Lauren Tom, Joshua Rush, and Asher Angel. Andi Mack debuts on Disney Channel on April 7th. What do you think? Do you watch Disney Channel? Will you watch Andi Mack? More about: Andi Mack, Andi Mack: canceled or renewed?, Disney Channel TV shows: canceled or renewed? Stupid… you cancelled Liv & Maddie to play a show like this!? Some of the things she wore was inappropriate… and why all the drama in the show!? …Our family won’t be watching this… boo!! Honestly, Liv & Maddie Callie Style is a forced sequel in its nature, and if they cancel that to play a show about a dynamic main character who struggles with problems that many children would normally be ashamed about, it seems like a good sacrifice. The family shown in this show is not a typical nuclear family. They all love each other anyways. Its important for children to know that no matter what, their family is not less than because it is underrepresented. Incredible start. Could be DC’s chance to grow up in some corners. Not that I wish to say goodbye to over-the-top It’s a Laugh Productions… Nope, keep it. But good to try new things and have variety.